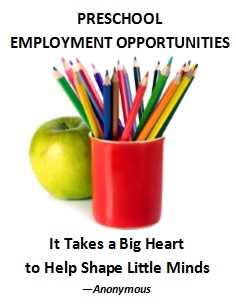 Wee Care is seeking qualified, experienced, fun loving and committed full time teachers! "Wee Care" is a preschool and child-development center at Resurrection Ministries, providing a loving and safe, Christian-based environment. Our curriculum includes language, math, science, worship, practical life, art, blocks, manipulative, dramatic play, children's discovery and outside play. We provide opportunities to explore and discover, promote independence with choices, and create a sense of responsibility within our children. We offer a full benefits package including: Medical, dental, vision, PTO, Holiday pay, and retirement savings. 12 ECE units, CPR & first aid certification, and fingerprint clearance. Experience teaching and/or knowledge of the Bible, and a relationship with Jesus as we are a church based center. Infant/Toddler units a bonus but not required.